Homage continues its “Road to WrestleMania” countdown with a new t-shirt based on the greatest spectacle in sports entertainment! Every Monday for nine weeks, Homage is introducing a new WWE t-shirt commemorating the matches, the wrestlers and the memories of WrestleMania. This week’s t-shirt pays tribute to 1996’s WrestleMania XII at the Arrowhead Pond, which featured one of the greatest matches of all time – a 60+ minute iron man match between Bret “Hitman” Hart and The Heartbreak Kid Shawn Michaels for the WWE Heavyweight Championship. For HBK the moment was 18 years in the making—the culmination of nearly two decades of traveling, training and working his way up the wrestling ranks for the opportunity to win the WWE Heavyweight Championship. After the final bell sounded, Michaels sat in awe as he was awarded his very first WWE World Championship. His boyhood dream had come true! 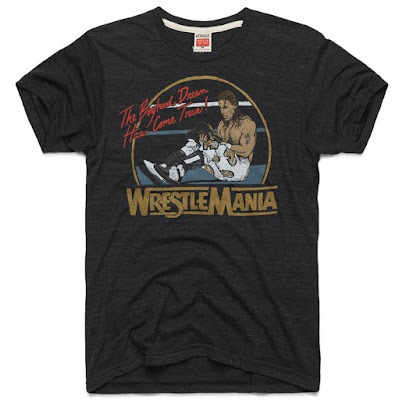 The WrestleMania XII t-shirt “The Boyhood Dream” is available now, in sizes XS-3XL, at the Homage online store for $32. And if you use this link here to make your purchase you can get 20% off your next purchase!